Update: I do not plan any further releases of Fragmentarium. It is inspired by Adobe's Pixel Bender, but uses GLSL, and is created specifically with fractals and generative systems in mind. Progressive rendering, for high quality AA, and distributed ray tracing. 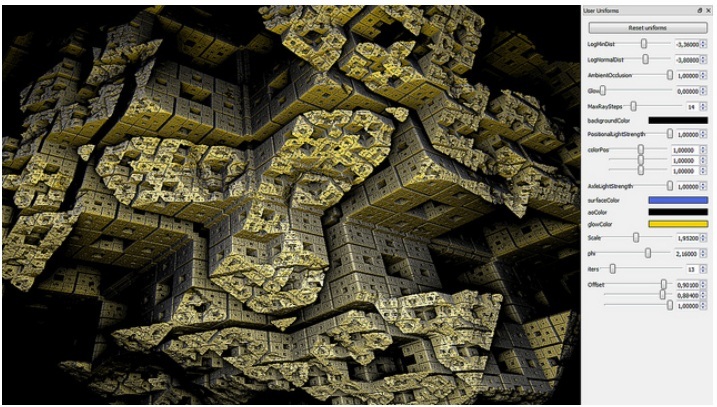 More than 100 examples, including 3D fractals (Mandelbulb, Mandelbox, Quaternion, Kaleidoscopic IFS), 2D fractals (Mandelbrots, Ducks, spherical Julias), Heightmaps, Knots and Hyperbolic Tesselations. Fragmentarium is built in C++, OpenGL/GLSL, and Qt 4. Fragmentarium is currently in the early development phase, but is getting more mature! Read more about getting Fragmentarium or more about using Fragmentarium. The progress and design considerations can be tracked at the Syntopia blog. If you like Fragmentarium, you might like its sister project, Structure Synth. Binary Mac OS X builds for Fragmentarium 0.9.12. Updated Windows builds for better ATI / Intel compatibility. Released Windows Binaries for Fragmentarium 0.9. Released Mac Binaries for Fragmentarium 0.8. Released Windows Binaries for Fragmentarium 0.8.0 - much better camera control, support for high-resolutions renders, animations, and presets. Added Mac Binaries for Fragmentarium 0.5.6. Released Windows Binaries for Fragmentarium 0.5.6. (Better ATI support - once again). Created a new usage page. Released Windows Binaries for Fragmentarium 0.5.0. First lines of code added. Everyone is welcome to upload their Fragmentarium creations here, preferably with the script included. Fragmentarium is being developed by Mikael Hvidtfeldt Christensen (mail: mikael (at) hvidtfeldts.net). It is free software, licensed under the GPL/LGPL license. Much of the inspiration and formulas for Fragmentarium came from the community at Fractal Forums, including Tom Beddard, Jan Kadlec, Iñigo Quilez, Buddhi, Jesse, and others. Special thanks goes out to Knighty and Kali for their great fragment contributions. The icons in the GUI are part of the Everaldo: Crystal project. 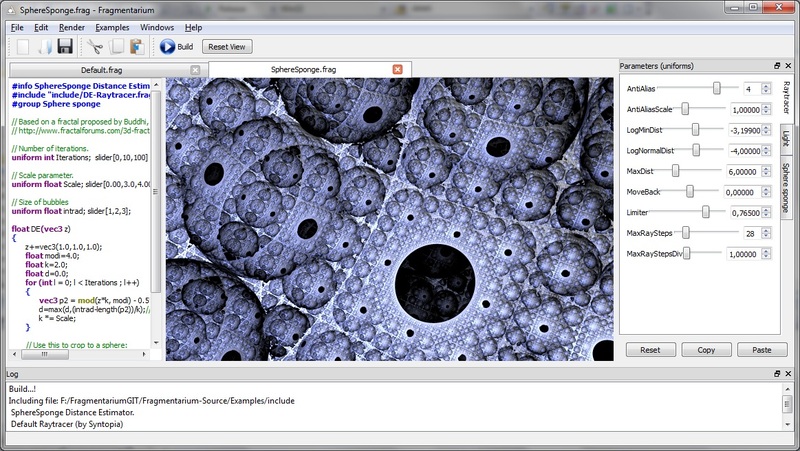 Fragmentarium is built using the Qt cross-platform GUI framework. Web pages based on a design by NodeThirtyThree.